Jeeuh, baby! Do you want something different than giving a hug bug? 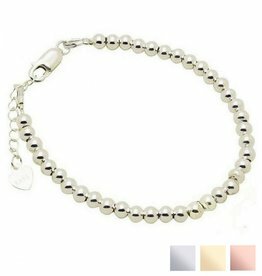 A baby bracelet of shiny gems is the perfect baby shower gift to surprise the new mother. 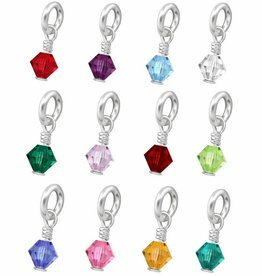 Additional personally make the baby gem with a name or text charm. We like to engrave the date of birth, first name and date of baptism. With this particular personalized baby shower gift you can certainly arrive, success is assured. This giftbox with this through-and-through silver bracelet is a perfect gift for the communion , especially since you can engrave the front and the back. Dear heart speaks for itself! This giftbox with this through-and-through silver bracelet is a perfect gift, especially since you can engrave the front and the back. Dear heart speaks for itself! One for you and one for your best vriedin, how sweet is that? Carry along this .925 silver bracelets that symbolize your band. 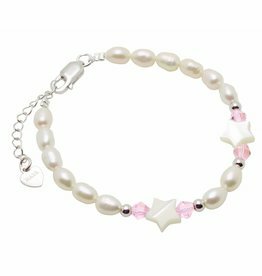 This sweet (.925) silver children's bracelet is a true showpiece; made of real freshwater pearls, interspersed with Swarovski crystals, silver beads and shimmering pearl stars. What they will shine with this bracelet on her wrist! With a baby, there are a lot of special moments you want to keep and remember. The first tooth, the first lock of hair, the first words, but also your first baby bracelet. 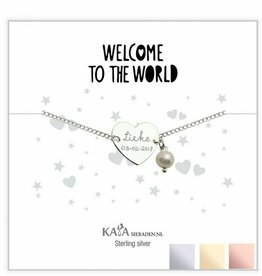 KAYA made especially for this beautiful keepsake baby bracelet piece by piece of real freshwater pearls combined with precious stones and Swarovski crystals. Make it personal by a charm with her name or special text. Great fun for her chubby polsje during her first photo shoot or birthday, and later a tangible reminder. To watch together once again small she was when she wore this tiny baby jewelry. With each baby jewelery making KAYA matching mommy bracelets. It is the perfect baby shower gift or baby shower gift for any newborn baby and its mother. They have been lovingly connected with beautiful glittering bracelets, how sweet is that? See the baby jewelry with matching mommy jewelry . Want to adapt to the baby bracelet? All babies gems are made by hand, so much is possible. The quickest is to chat with Tanja (bottom right button). Of course we know how strong a baby's hand, so we use for all baby bracelets extra strong steel wire which is not just destroy! For many years to have fun baby bracelet we mount a strong extension chain to each baby bracelet so that it grows some time with your baby. 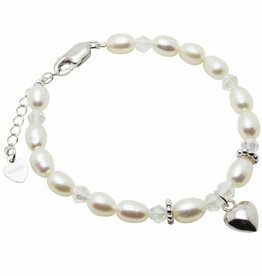 Every mother knows that genuine freshwater pearls are a precious gift, and diamonds a girls 'best friend'. Therefore, we combine the finest freshwater pearls with Swarovski® crystals for our baby bracelets collections. They are not for nothing that one of the best selling collections of KAYA jewelry. For now a beautiful ornament to wear, a tangible reminder for later. KAYA has been making her baby bracelets made, starting at 11 centimeters. Sometimes a baby polsje even smaller, but it fits quickly after a few weeks. We assemble the flexibility to tailor each bracelet an extension chain, so it fits almost always grows a few years with your child along. KAYA because its makes bracelets in stock, we can do same day your baby jewelry on the post. So you have the baby bracelet all the next day! Would you all give a personalized baby gift, check here baby bracelets by name . 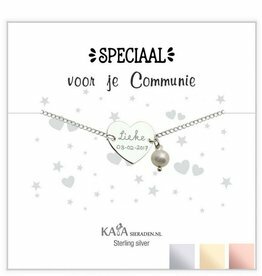 You also need the door to a beautiful gift box, baby jewelry adje we pack into a sweet sieradenbuideltje, so is the same bracelet ready for gift giving. Wants to give you a truly personal gift? 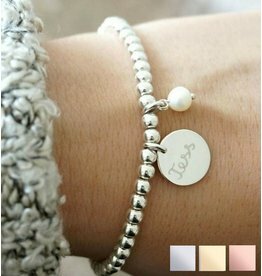 Take a look at our baby bracelet with the name. This is really a personal baby shower gift or gift for her birthday! We engrave her name in hearts charms and hang it to the baby ornament. With the extension chain she still approximately 3 years fun of her baby bracelet with the name. Then this baby name bracelet is attached a tangible reminder that is cherished in the "storage box-to-back." Because KAYA Jewelry heart for all children, by donating it sold brand baby bracelets amounting to a foundation that makes it possible that children in The Gambia to school: perhaps the jewel that is. All baby jewelry we package in a luxurious silk sieradenbuideltje. With such a sweet and strong baby bracelet you definitely give a unique kraamcadea you.